Recently, after completing – without hospitalization or arrest (for significant abuse of a power tool) a major painting project involving thirty-five exterior louvered house shutters attached to My Old House – many people asked me how old the vinyl shutters actually are, when they had first been put up (“gee, when were they last painted?”), and how did I know? Every family historian hopes for, looks for, desires, and covets delicious diaries, copious correspondence, and juicy journals from ancestors of any generation. Sometimes our perception of these things requires some adjustment. I am among those who covet diaries such as that of Regina Shober Gray. 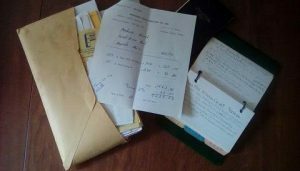 I have precious few letters from any of my ancestors, and only two diaries of my paternal grandmother, who used it to record daily weather and how many eggs her hens laid, skipping any significant family commentary. No, I get invoices, receipts, and cancelled checks. My mother was undoubtedly the most organized person I’ve ever known. Instead of inheriting her diaries or journals (she didn’t keep any), she left me a manila business envelope full of receipts and cancelled checks in chronological order, estimates and itemizations of work requested, and a small “memo book” noting by brand name how much wallpaper and paint she used in what room, as well as a small 2” x 3” three-ring notebook listing what work was done when, by whom, and how much was paid, all covering more than forty years. For this owner of such an old house, they are treasures of information and great conversation pieces, both of the maintenance of the house and its own genealogy. While my parents moved into My Old House in 1944, the earliest extant record is from 1972. The restoration contractors and architectural historians who have worked on or visited the house have offered their own opinions of its original construction, earliest changes or additions, and maintenance. For this owner of such an old house, they are treasures of information and great conversation pieces, both of the maintenance of the house and its own genealogy. These receipts and cancelled checks are a record of achievement: for my parents in their efforts to keep the house upright, scheduling projects and handling unexpected repairs (as well as managing the funding), and for the house in withstanding all that Man and Mother Nature have served up for almost 230 years. They are the data of the house’s genealogy, the “tree” of family ownership for centuries (quite literally: its wood was cut on this land). They point to the earliest construction methods used by its builder through discoveries during our restoration project in 2006, the affluence of the family in the 1820s from the cost of the original wallpaper in an upstairs room, and the gradual acceptance of post-911 technologies in a Revolutionary War-era house. While we all may fear “becoming our mothers,” I discovered early in our restoration efforts that I was organizing things the same way that my mother did, continuing my mother’s collection of receipts and notations with my own organization of invoices, receipts, and “paid” stamps (cancelled checks have gone to live with the Dodo Bird and Elvis, giving way to digital images). Given the restoration work we’ve accomplished in the last decade, my organization consists of a bulging four-inch binder with pockets, even if I haven’t kept every itemization from the hardware store! In an effort to enhance the story told by all of my mother’s receipts, I’ve also put together binders weaving together the history of the house and its family. It is perception that decides what makes a diary. The old manila envelope and small notebooks are diaries, the Diaries of An Old House, written by My Old House but compiled and preserved by my mother, proving that even the most mundane, cluttery piece of paper can yield a family story: these vinyl shutters were hung in stages in 1993 and 1994, when my parents were in their 80s and willing to pay someone else to do the work. I am my mother’s daughter: I paid someone else to take them down and put them back! Yes, a house has a history too and many appreciate knowing it. A few years ago my husband was able to tell the owners of his childhood home how the house used to be, when certain improvements were made, how the family came and went in it, etc., and sent pictures of the way it was. This is history too. Jan, you are so right when you say that “even the most mundane, cluttery piece of paper can yield a family story.” In every little scrap of paper – there is the possibility for a hidden truth to pop up – priceless! – Always enjoy hearing about your journey!